In February, 1945, Joseph Stalin, Winston Churchill and Franklin D. Roosevelt met to discuss what would happen after the Second World War. The conference was held in Yalta on the north coast of the Black Sea in the Crimean peninsula. With Soviet troops in most of Eastern Europe, Stalin was in a strong negotiating position. Roosevelt and Churchill tried hard to restrict post-war influence in this area but the only concession they could obtain was a promise that free elections would be held in these countries. Poland was the main debating point. Stalin explained that throughout history Poland had either attacked Russia or had been used as a corridor through which other hostile countries invaded her. Only a strong, pro-Communist government in Poland would be able to guarantee the security of the Soviet Union. The historian, Christopher Andrew, who has made a close study of the KGB archive, has argued that Stalin was determined to discover what Allied leaders were thinking: "Yalta was to prove an even bigger success for Soviet intelligence than Tehran. This time both the British and the American delegations, housed respectively in the ornate Vorontsov and Livadia palaces, were successfully bugged. The mostly female personnel used to record and transcribe their private conversations were selected and transported to the Crimea in great secrecy. Not till they arrived at Yalta did they discover the jobs that had been assigned to them. The NKGB sought, with some success, to distract both delegations from its surveillance of them by lavish and attentive hospitality, personally supervised by a massive NKGB general, Sergei Nikiforovich Kruglov." 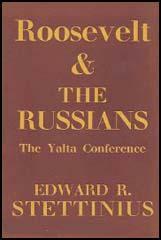 Alger Hiss, an American official at the Yalta Conference, pointed out in his autobiography, Recollections of a Life (1988): "As I look back on the Yalta Conference after more than forty years, what stand out strikingly are the surprising geniality as host and the conciliatory attitude as negotiator of Joseph Stalin, a man we know to have been a vicious dictator. I am also reminded that in almost all of the analyses and criticism of the Yalta accords that I have read, I have not seen adequate recognition of the fact that it was we, the Americans, who sought commitments on the part of the Russians. Except for the Russian demand for reparations, coolly received by the United States, all the requests were ours." William Leahy, Roosevelt's chief of staff, later pointed out: "Stalin then brought up the question of reparations in kind and in manpower, but said he was not ready to discuss the manpower question. The latter, of course, referred to forced labour. Since the Russians were using many thousands of prisoners in what was reported to be virtual slave camps, they had little to gain by discussing the matter.... The proposal in brief was: Reparations in kind should include factories, plants, communication equipment, investments abroad, etc., and should be made over a period of ten years, at the end of which time all reparations would have been paid. The total value of the reparations in kind asked by the Soviet was 10 billion dollars, to be spread over the ten-year period... Churchill objected to the 10 billion-dollar figure, and he and Roosevelt agreed that a reparations committee should be appointed to study the issue." Winston Churchill stated: "The peace of the world depends upon the lasting friendship of the three great powers, but His Majesty's Government feel we should be putting ourselves in a false position if we put ourselves in the position of trying to rule the world when our desire is to serve the world and preserve it from a renewal of the frightful horrors which have fallen upon the mass of its inhabitants." Joseph Stalin and Franklin D. Roosevelt agreed and at Yalta, the decision at Teheran to form a United Nations organization was confirmed. It was only on this issue that all three leaders were enthusiastically in agreement. Anthony Eden, the British foreign minister, pointed out: "Roosevelt was, above all else, a consummate politician. Few men could see more clearly their immediate objective, or show greater artistry in obtaining it. As a price of these gifts, his long-range vision was not quite so sure. The President shared a widespread American suspicion of the British Empire as it had once been and, despite his knowledge of world affairs, he was always anxious to make it plain to Stalin that the United States was not 'ganging up' with Britain against Russia. The outcome of this was some confusion in Anglo-American relations which profited the Soviets. Roosevelt did not confine his dislike of colonialism to the British Empire alone, for it was a principle with him, not the less cherished for its possible advantages. He hoped that former colonial territories, once free of their masters, would become politically and economically dependent upon the United States, and had no fear that other powers might fill that role." However, Alger Hiss disagreed with this analysis: "As I look back on the Yalta Conference after more than forty years, what stand out strikingly are the surprising geniality as host and the conciliatory attitude as negotiator of Joseph Stalin, a man we know to have been a vicious dictator. I am also reminded that in almost all of the analyses and criticism of the Yalta accords that I have read, I have not seen adequate recognition of the fact that it was we, the Americans, who sought commitments on the part of the Russians. Except for the Russian demand for reparations, coolly received by the United States, all the requests were ours. And, except for Poland, our requests were finally granted on our own terms. In agreeing to enter the war against Japan, Stalin asked for and was granted concessions of his own, but the initiative had been ours-we had urgently asked him to come to our aid." At the time of Yalta, Germany was close to defeat. British and USA troops were advancing from the west and the Red Army from the east. At the conference it was agreed to divide Germany up amongst the Allies. However, all parties to that agreement were aware that the country that actually took control of Germany would be in the strongest position over the future of this territory. The main objective of Winston Churchill and Stalin was the capture of Berlin, the capital of Germany. Franklin D. Roosevelt did not agree and the decision of the USA Military commander, General Dwight Eisenhower, to head south-east to Dresden, ensured that Soviet forces would be the first to reach Berlin. Christopher Andrew, the author of The Mitrokhin Archive (1999), is an historian who believes that Joseph Stalin completely out-negotiated Franklin D. Roosevelt and Winston Churchill at Yalta: "The problem which occupied most time at Yalta was the future of Poland. Having already conceded Soviet dominance of Poland at Tehran, Roosevelt and Churchill made a belated attempt to secure the restoration of Polish parliamentary democracy and a guarantee of free elections. Both were outnegotiated by Stalin, assisted once again by a detailed knowledge of the cards in their hands. He knew, for example, what importance his allies attached to allowing some 'democratic' politicians into the puppet Polish provisional government already established by the Russians. On this point, after initial resistance, Stalin graciously conceded, knowing that the 'democrats' could subsequently he excluded. After first playing for time, Stalin gave way on other secondary issues, having underlined their importance, in order to preserve his allies' consent to the reality of a Soviet-dominated Poland. Watching Stalin in action at Yalta, the permanent under-secretary at the Foreign Office, Sir Alexander Cadogan, thought him in a different league as a negotiator to Churchill and Roosevelt." It has been argued by G. Edward White, the author of Alger Hiss's Looking-Glass Wars (2004) that Alger Hiss himself had a profound impact on the conference. "Hiss's increased access to confidential sources, especially after he became an assistant to Secretary of State Edward Stettinius, made it possible for him to funnel intelligence information of considerable value to the Soviets. For example, Hiss's placement, coupled with that of the British Soviet agent Donald Maclean, who held a high-level post in the British Embassy in Washington from 1944 to 1949, meant that Stalin had a firm grasp of the postwar goals of the United States and Great Britain before the Yalta Conference." White points out that Hiss, Donald Maclean, Kim Philby and other British-based Soviet agents in "providing a regular flow of classified intelligence or (confidential) documents in the run-up to (Yalta.)" A recently released KGB document dated March 1945 shows that the Soviets were very pleased with Hiss's contribution during the Yalta Conference: "Recently ALES (Hiss) and his whole group were awarded Soviet decorations. After the Yalta conference, when he had gone on to Moscow, a Soviet personage in a cry responsible position (ALES gave to understand that it was Comrade Vyshinsky, deputy foreign minister), allegedly got in touch with ALES and at the behest of the military NEIGHBOURS (GRU) passed oil to him their gratitude and so on." Poland was the main debating point. Stalin explained that throughout history Poland had either attacked Russia or had been used as a corridor through which other hostile countries invaded her. Only a strong, pro-Communist government in Poland would be able to guarantee the security of the Soviet Union. Stalin then brought up the question of reparations in kind and in manpower, but said he was not ready to discuss the manpower question. The latter, of course, referred to forced labour. Since the Russians were using many thousands of prisoners in what was reported to be virtual slave camps, they had little to gain by discussing the matter. Stalin then had Deputy Foreign Commissar Maisky elaborate on the Russian view of the reparations question. The proposal in brief was: Reparations in kind should include factories, plants, communication equipment, investments abroad, etc., and should be made over a period of ten years, at the end of which time all reparations would have been paid. The total value of the reparations in kind asked by the Soviet was 10 billion dollars, to be spread over the ten-year period. The German heavy industries should be cut down and 80 per cent. removed in a period of two years after the surrender. Allied control should be established over German industry, and all German industry that could be used in the production of war material should be under international control for a long period. Churchill objected to the 10 billion-dollar figure, and he and Roosevelt agreed that a reparations committee should be appointed to study the issue. Roosevelt made it clear that the United States would not make the financial mistakes that followed World War I. He added that America would not want any manpower, any factories, or any machinery. It might want to seize German property in the United States, which at that time was estimated not to exceed 200 million dollars. Reparations presented a very complicated problem, and the appointment of a special commission seemed to be the only possible way to arrive at any kind of recommendation that could be accepted. (2) James F. Byrnes, as Secretary of State, attended the Yalta Conference on 4th February, 1945. In the fall of 1944 the Soviet Union and the Provisional Government of France had entered into a treaty of friendship. It was immediately obvious at Yalta, however, that the treaty and the friendly words exchanged over it by the diplomats had not changed in any degree Marshal Stalin's opinion on the contribution of France to the war. He thought France should play little part in the control of Germany, and stated that Yugoslavia and Poland were more entitled to consideration than France. When Roosevelt and Churchill proposed that France be allotted a zone of occupation, Stalin agreed. But it was clear he agreed only because the French zone was to be taken out of the territory allotted to the United States and the United Kingdom. And he especially opposed giving France a representative on the Allied Control Council for Germany. He undoubtedly concurred in the opinion expressed to the President by Mr. Molotov that this should be done "only as a kindness to France and not because she is entitled to it." Churchill argued strongly in favor of France's being represented on the Council. He said the British public would not understand if questions affecting France and the French zone were settled without her participation in the discussion. It did not follow, as Stalin had suggested, that France would' demand de Gaulle's participation in the conferences of the Big Three, he added. And, in his best humor, Mr. Churchill said the conference was "a very exclusive club, the entrance fee being at least five million soldiers or the equivalent." (3) Conversation between Winston Churchill and Joseph Stalin at Yalta. Winston Churchill: "The peace of the world depends upon the lasting friendship of the three great powers, but His Majesty's Government feel we should be putting ourselves in a false position if we put ourselves in the position of trying to rule the world when our desire is to serve the world and preserve it from a renewal of the frightful horrors which have fallen upon the mass of its inhabitants. We should make a broad submission to the opinion of the world within the limits stated. We should have the right to state our case against any case stated by the Chinese, for instance, in the case of Hongkong. There is no question that we could not be required to give back Hong Kong to the Chinese if we did not feel that was the right thing to do. On the other hand, I feel it would be wrong if China did not have an opportunity to state its case fully. In the same way, if Egypt raises a question against the British affecting the Suez Canal, as has been suggested, I would submit to all the procedure outlined in this statement. colleagues on the Security Council." Joseph Stalin: "I would like to have this document to study because it is difficult on hearing it read to come to any conclusion. I think that the Dumbarton Oaks decisions have, as an objective, not only to secure to every nation the right to express its opinion, but if any nation should raise a question about some important matter, it raises the question in order to get a decision in the matter. I am sure none of those present would dispute the right of every member of the Assembly to express his opinion. "Mr. Churchill thinks that China, if it raised the question of Hong Kong, would be content only with expressing opinion here. He may be mistaken. China will demand a decision in the matter and so would Egypt. Egypt will not have much pleasure in expressing an opinion that the Suez Canal should be returned to Egypt, but would demand a decision on the matter. Therefore, the matter is much more serious than merely expressing an opinion. Also, I would like to ask Mr. Churchill to name the power which may intend to dominate the world. I am sure Great Britain does not want to dominate the world. So one is removed from suspicion. I am sure the United States does not wish to do so, so another is excluded from the powers having intentions to dominate the world." Winston Churchill: "May I answer?" time it is not very clear to me. I think it is a more serious question than the right of a power to express its intentions or the desire of some power to dominate the world." Winston Churchill: "I know that under the leaders of the three powers as represented here we may feel safe. But these leaders may not live forever. In ten years' time we may disappear. A new generation will come which did not experience the horrors of war and may probably forget what we have gone through. We would like to secure the peace for at least fifty years. We have now to build up such a status, such a plan, that we can put as many obstacles as possible to the coming generation quarreling among themselves." Roosevelt was, above all else, a consummate politician. Few men could see more clearly their immediate objective, or show greater artistry in obtaining it. As a price of these gifts, his long-range vision was not quite so sure. The President shared a widespread American suspicion of the British Empire as it had once been and, despite his knowledge of world affairs, he was always anxious to make it plain to Stalin that the United States was not 'ganging up' with Britain against Russia. The outcome of this was some confusion in Anglo-American relations which profited the Soviets. Roosevelt did not confine his dislike of colonialism to the British Empire alone, for it was a principle with him, not the less cherished for its possible advantages. He hoped that former colonial territories, once free of their masters, would become politically and economically dependent upon the United States, and had no fear that other powers might fill that role. Winston Churchill's strength lay in his vigorous sense of purpose and his courage, which carried him undismayed over obstacles daunting to lesser men. He was also generous and impulsive, but this could be a handicap at the conference table. Churchill liked to talk, he did not like to listen, and he found it difficult to wait for, and seldom let pass, his turn to speak. The spoils in the diplomatic game do not necessarily go to the man most eager to debate. Marshal Stalin as a negotiator was the toughest proposition of all. Indeed, after something like thirty years' experience of international conferences of one kind and another, if I had to pick a team for going into a conference room, Stalin would be my first choice. Of course the man was ruthless and of course he knew his purpose. He never wasted a word. He never stormed, he was seldom even irritated. Hooded, calm, never raising his voice, he avoided the repeated negatives of Molotov which were so exasperating to listen to. By more subtle methods he got what he wanted without having seemed so obdurate. There was a confidence, even an intimacy, between Stalin and Molotov such as I have never seen between any other two Soviet leaders, as if Stalin knew that he had a valuable henchman and Molotov was confident because he was so regarded. Stalin might tease Molotov occasionally, but he was careful to uphold his authority. Only once did I hear Stalin speak disparagingly of his judgment and that was not before witnesses. As I look back on the Yalta Conference after more than forty years, what stand out strikingly are the surprising geniality as host and the conciliatory attitude as negotiator of Joseph Stalin, a man we know to have been a vicious dictator. I am also reminded that in almost all of the analyses and criticism of the Yalta accords that I have read, I have not seen adequate recognition of the fact that it was we, the Americans, who sought commitments on the part of the Russians. Except for the Russian demand for reparations, coolly received by the United States, all the requests were ours. And, except for Poland, our requests were finally granted on our own terms. In agreeing to enter the war against Japan, Stalin asked for and was granted concessions of his own, but the initiative had been ours-we had urgently asked him to come to our aid. The meeting, in early February 1945, came at a turning point in the war. A series of Allied successes had assured victory in Europe. It was time to agree upon peace terms to be demanded from Germany. But only a few weeks earlier the Battle of the Bulge had shown that the German military machine was still dangerous, and plans were needed for joint military action to finish it off. It was also important to discuss the future of liberated Europe and to complete plans for the creation of a postwar world organization, the United Nations. The war in the Far East was then far from settled. Fanatic Japanese defense of the islands that Japan had occupied in the Pacific heralded a costly invasion of the home islands, unless Russia could be brought into the Far Eastern war in which it had remained neutral. Our Joint Chiefs of Staff thought that if Russia did not join us, we might even have to invade Manchuria, where a powerful separate Japanese army was stationed as a defense against Russia. President Roosevelt had two main objectives in coming to Yalta, one military and one political. His military objective at the Crimea Conference (for that is what it was officially called) was to obtain from Stalin a firm commitment and a definite date for Soviet entry into the war against Japan, the subject of an informal agreement at the Teheran Conference a year earlier but there left indefinite. Roosevelt's political objective was to outline the terms of the future peace in Europe and to complete the partial agreement with the British and the Russians for the United Nations Charter. Accord on the general structure of the UN had been reached late the preceding summer in the Dumbarton Oaks Conversations in Washington, but that accord covered only some of the essential elements of the charter. Roosevelt gained both of his objectives, sound reason for the exuberant mood of the Americans as we left Yalta eight days after our arrival in the most trying of wartime circumstances. Soviet entry into the war against Japan had for months been a major objective of our Joint Chiefs of Staff, chaired by General George C. Marshall. The Joint Chiefs had told us diplomats that Russian participation in the war in the Far East would prevent a million American casualties. And without it, they said, the Pacific conflict would last at least until the latter part of 1946. This, then, was a goal of utmost importance, of immeasurable value to us. As we were leaving Yalta at the end of the conference, I heard General Marshall's reply to Secretary of State Stettinius's observation that the general must be eager to return to his desk after an absence of approximately two weeks. "Ed," said Marshall, "for what we have got here I would gladly have stayed a month." And in his memoirs Averell Harriman, at the time our ambassador to Moscow, quotes crusty Admiral William Leahy, Roosevelt's personal military adviser, as saying, "This makes the whole trip worthwhile." On our arrival at Saki airport in the Crimea on the morning of February 3, 1945, Roosevelt and Churchill were met by Molotov and other Soviet officials. An impromptu guard of honor, Russian soldiers in ill-matching field garb, had been drawn up to greet the two Western leaders. It seemed that the Russians had eyes only for Roosevelt. I wanted, especially, to see how the sight of FDR's physical affliction would affect them. Roosevelt carried himself nobly, erect on his pile of furs. As his jeep went up and down the irregular lines, the faces of the men he was reviewing seemed to reveal quite openly a mixture of awe and admiration. To me, the incident illustrated the universal potency of the Roosevelt presence, and the warmth of the friendly attitude displayed was, I felt, a happy augury for the success of our negotiations. We had a long, cold, uncomfortable and quite exhausting drive of seven to eight hours over war-damaged roads from the airport at Saki to our Yalta quarters. Stalin did not arrive until the next day. He then paid a courtesy call on Roosevelt, an occasion used also for a private discussion of the major American objective, Soviet entry into the war against Japan. That afternoon the first plenary session was held. Like all the other plenary sessions, it took place at Livadia Palace, and President Roosevelt presided. This practice was based on protocol, for Roosevelt was not only head of government but also chief of state and thus technically outranked Churchill and Stalin. My inclusion in the American delegation was a matter of chance. When Secretary of State Stettinius presented Roosevelt with a list of the State Department personnel that Stettinius proposed to take with him as aides, the President immediately vetoed Jimmy Dunn. James Clement Dunn, later our ambassador to Italy under President Truman, had at the time of the Yalta Conference been for some years the director of an office in charge of European affairs in the State Department. A small, slight, dapper man, he was by no means the only State Department or Foreign Service officer whose views were more conservative than Roosevelt's. But Dunn was perhaps outstanding in the openness of his opposition to the President's liberalism. When FDR said he wouldn't have Dunn at Yalta, Stettinius proposed me because of my participation in the State Department's work on the projected United Nations, which included my service as secretary of the Dumbarton Oaks Conversations. As Stettinius later recounted the incident to me, the President had said he didn't care who was named, provided it wasn't Dunn. This was an example of the tension that exists between a strong, liberal president on the one hand and the traditionally conservative Department of State and its Foreign Service on the other. The Department and the Foreign Service regard themselves as permanent custodians of American foreign policy, as compared with presidents, who come and go. There was a saying in Roosevelt's Washington that the writ of the New Deal ran throughout the government except for the State Department. True to its conservative bent, the State Department remained aloof from liberal elements of Roosevelt's policies. This helps to explain why, soon after FDR's death, willingness to negotiate differences with the Soviet Union, as at Yalta, changed to confrontation. A representative expression of opposition to Roosevelt's policies, which at times almost reached disaffection, is apparent throughout the first part of George Kennan's memoirs, which deals with his early years in the Foreign Service. Almost exactly my age and with a similar background, Kennan (who was to become, briefly, United States Ambassador to Moscow in 1952) was clearly estranged from the reformist spirit of the New Deal which I found so congenial. Hiss's increased access to confidential sources, especially after he became an assistant to Secretary of State Edward Stettinius, made it possible for him to funnel intelligence information of considerable value to the Soviets. For example, Hiss's placement, coupled with that of the British Soviet agent Donald Maclean, who held a high-level post in the British Embassy in Washington from 1944 to 1949, meant that Stalin had a firm grasp of the postwar goals of the United States and Great Britain before the Yalta Conference. A recent study, in highlighting Soviet intelligence success in the 1940s, singled out the contributions of Hiss, Maclean, and other British-based Soviet agents in "providing a regular flow of classified intelligence or (confidential) documents in the run-up to (Yalta.)" "Some sense of how Moscow felt that good intelligence had contributed to Stalin's success at Yalta," the study concluded, "is conveyed by Moscow's congratulations to Hiss." The reference was to a secret meeting in Moscow, just after the Yalta Conference, at which Hiss was personally thanked for his efforts by Deputy Soviet Premier Andrei Vyshinki. Although there is clear evidence that Maclean and Hiss knew each other comparatively well, and were in a position to consult with one another publicly about postwar planning measures involving the Soviets, Hiss regularly denied any memory of even having met Maclean. Hiss's access to information also meant that the Soviets could use him to learn a good deal about prospective United States policy toward the Far East, because Hiss had been privy to internal deliberations about postwar goals in that region as an adviser to Hornbeck. In addition, State Department records show that Hiss, when affiliated with the Office of Special Political Affairs, had made requests for confidential information from the Office of Strategic Services on postwar atomic energy policy and the internal security of Britain, France, China, and the Soviet Union. In this period Hiss had the sponsorship, within the State Department, of Hornbeck, Pasvolsky, Stettinius, and Assistant Secretary of State Dean Acheson. Yalta was to prove an even bigger success for Soviet intelligence than Tehran. This time both the British and the American delegations, housed respectively in the ornate Vorontsov and Livadia palaces, were successfully bugged. The mostly female personnel used to record and transcribe their private conversations were selected and transported to the Crimea in great secrecy. Not till they arrived at Yalta did they discover the jobs that had been assigned to them. The NKGB sought, with some success, to distract both delegations from its surveillance of them by lavish and attentive hospitality, personally supervised by a massive NKGB general, Sergei Nikiforovich Kruglov. When Churchill's daughter, Sarah, casually mentioned that lemon went well with caviar, a lemon tree appeared, as if by magic, in the Vorontsov orangery. At the next Allied conference, in Potsdam, General Kruglov was rewarded with a KBE, thus becoming the only Soviet intelligence officer to receive an honorary knighthood. Stalin was even better informed about his allies at Yalta than he had been at Tehran. All of the Cambridge Five, no longer suspected of being double agents, provided a regular flow of classified intelligence or Foreign Office documents in the run-up to the conference, though it is not possible to identify which of these documents were communicated to Stalin personally. Alger Hiss actually succeeded in becoming a member of the American delegation. The problem which occupied most time at Yalta was the future of Poland. Having already conceded Soviet dominance of Poland at Tehran, Roosevelt and Churchill made a belated attempt to secure the restoration of Polish parliamentary democracy and a guarantee of free elections. Both were outnegotiated by Stalin, assisted once again by a detailed knowledge of the cards in their hands. He knew, for example, what importance his allies attached to allowing some `democratic' politicians into the puppet Polish provisional government already established by the Russians. On this point, after initial resistance, Stalin graciously conceded, knowing that the `democrats' could Subsequently he excluded. After first playing for time, Stalin gave way on other secondary issues, having underlined their importance, in order to preserve his allies' consent to the reality of a Soviet-dominated Poland. Watching Stalin in action at Yalta, the permanent under-secretary at the Foreign Office, Sir Alexander Cadogan, thought him in a different league as a negotiator to Churchill and Roosevelt: "He is a great man, and shows up very impressively against the background of the other two ageing statesmen." Roosevelt, in rapidly failing health and with only two months to live, struck Cadogan, by contrast, as "very woolly and wobbly". 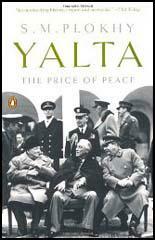 Roosevelt and Churchill left Yalta with no sense that thcy had been deceived about Stalin's true intenrions. Even Churchill, hitherto more sceptical than Roosevelt, wrote confidently, "Poor Neville Chamberlain believed he could trust Hitler. He was wrong. But I don't think I'm wrong about Stalin." Some sense of how Moscow felt that good intelligence had contributed to Stalin's success at Yalta is conveyed by its congratulations to Hiss. Recently ALES (Hiss) and his whole group were awarded Soviet decorations. After the Yalta conference, when he had gone on to Moscow, a Soviet personage in a cry responsible position (ALES gave to understand that it was Comrade Vyshinsky, deputy foreign minister), allegedly got in touch with ALES and at the behest of the military NEIGHBOURS (GRU) passed oil to him their gratitude and so on.